2140, この頃床に入る。Konokoro toko ni hairu. Go to bed. 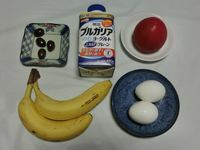 Chousyoku. Odiya ni Natto. Shichimi Tougarashi. Tamanegi no Marine ni Amaniyu no dressing. yogurt. Mikan. BF. 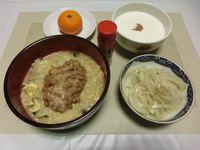 Oatmeal (Japanese rice oatmeal) with Natto. Nanami capsicum. Marinated Onion with Linseed oil dressing. Yogurt. 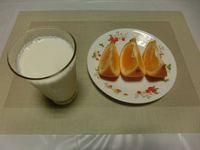 Mikan Japanese orange. Chuusyoku. Banana. Yude tamago. Tomato. Yogurt. Chocolate. Lunch. Bananas. a Tomato. Yogurt. Chocolate tabs. Yuusyoku. Tori no Sunagimo no Shio Kosyou aji. Avocado ni Oliveyu. 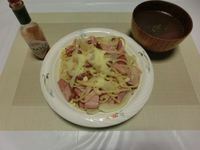 Bacon to Tamanegi no Spaghetti (kantien 80g). Yudejiru no soup. Tabasco. Gyuu-nyuu. Iyokan. Dinner. 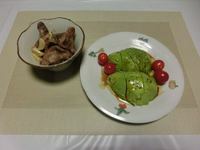 Simmered Chicken Gizzard by salt and pepper. Avocado with Olive oil. Spaghetti Bacon and Onion (dried noodle 80g). Soup. Tabasco. Milk. Iyokan Japanese orange.